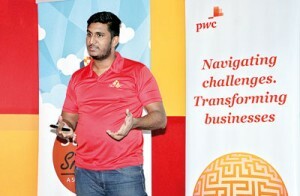 Sachira Fernando at a presentation. This old nursery rhyme comes into my mind as we meet NicNac founder and CEO Sachira Fernando. It is no old man which comes rolling home though, rather anything you wish delivered doorstep by this business which was recently adjudged the country’s best impact-oriented start-up at an international event in Finland. Think Jeeves (PG Wodehouse’s fictional butler) and you get the essence of NicNac which delivers customised service to satisfy every craving, be it a sudden liking to eat pineapples or to find out where the gay and lesbian community hangs out. Sachira also runs a software company called Erbenlab. This keeps him busy. It was constraints on his time that led to the creation of NicNac along with co-founder Ajith Prasanna. They started in May with 14 people on board. Today, that number has been cut down to three, a sign of success. Automation is the key to the growth of this delivery service. Everything is computerised. Your needs are recorded and matched on a platform. Previously human endeavour was needed to do these tasks, but now everything is done online leaving the very strangest requests for the human touch. “When someone types in a request we break it down into words and match the words and link it with that person’s history and area. We had 14 staff originally but have now cut it down to three because it is all automated. We have created scaling,” says the 25-year-old Sachira who bankrolled the company with Rs.500,000 of his savings. Close to 500 requests are serviced each day. One request was for 18 pineapples to be delivered, cut with a candle stuck on top of it. On another occasion, an illicit affair could only go ahead if a packet of condoms was delivered to the hotel room. One foreign lady wanted to know where the local LGBT community gathers. NicNac provides a lifeline for close to 150 people who are registered ‘butlers’ with around 40 being active at any one time. They use their own bikes to transport customers’ requests and work on a commission basis. Charges are roughly between 200 rupees to 2,000 rupees. NicNac takes a 10 per cent cut with the rest going to the delivery man. There are plans now to enforce a subscription fee of US$1 per month for customers. In 2010, Sachira was playing rugby as a lock forward for St. Thomas’ College. Even Jeeves couldn’t have helped him out in the ruck and maul. A helping hand is on offer now, however. There are six drivers and they take on the responsibility of getting you home after a good night out. Charges are reasonable considering the recent hike in penalties – within Colombo it will cost you between Rs.1500 and 2000 to get you home safely and tucked in bed. They drive your car and park it in your garage and the butler then goes home in a NicNac car which has followed. Another service which is also as popular is driving licence-recovery. Say you get caught speeding in the boondocks, Avissawella or Kurunagela, and the eager cops insist on taking your licence, then you can get NicNac to pay the fine and go to the police station of the area to recover your licence to thrill. NicNac is a huge hit. Earlier this month it was judged Sri Lanka’s best impact oriented start-up at the SLUSH Global Impact Accelerator beating 14 other competitors. Sachira flew to Helsinki, Finland to represent the country at the international leg. The future looks bright. Dr. Harsha Subasinghe, CEO of CodeGen, has invested in the company which is now looking overseas to grow. Already they have made an impact in Vietnam. “We are looking at implementing this in Europe. A number of On-Demand models, especially in countries like India, Singapore and Indonesia, have miserably failed and many have closed down operations,” revealed Sachira. “Getting customers is not a problem but retaining them is. And this is the key. Whenever people ask for things you must be able to fulfil it. That is why we have automated it. With a staff of three we now handle 500 requests simply because we have automated. “We have figured out how this can be done and we believe this can scale globally. We have already tried it out in Vietnam, and with about 50 US dollars of Facebook advertising we have 3,000 users and eight riders in Vietnam and I haven’t even been there. We are also looking at the social impact side as it is creating jobs. People don’t need to have paper qualifications to do this,” added Sachira.